January 2014 – on my way: make it someday. 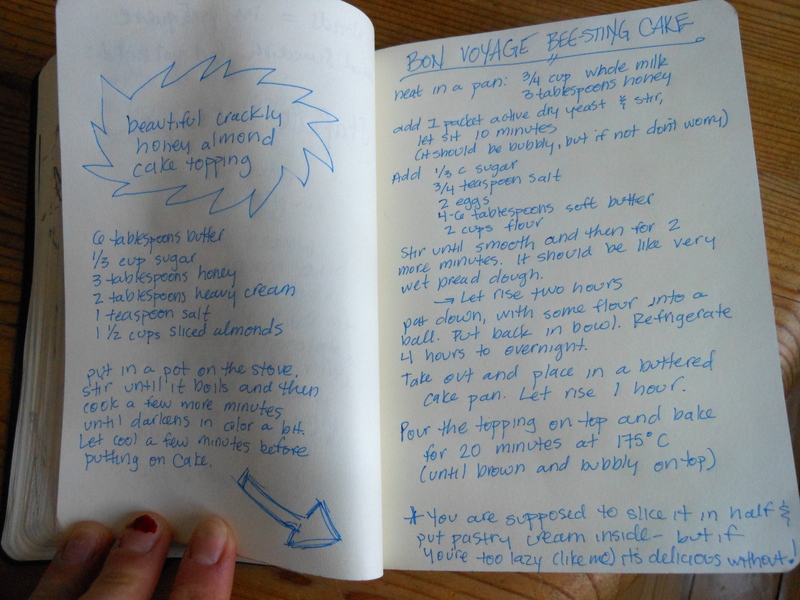 I’ve wanted to make this cake ever since Deb Perelman posted it on the Smitten Kitchen site sometime last spring. I don’t know if it was my obsession with bees, or the story of trying and trying but never getting the cake quite right, or the description of the cake itself, but Bee Sting Cake? It sounded great. I just never had the energy to make a yeasted cake, though. So I didn’t. Then, when I was in Munich, I defended my thesis and stopped at the bakery on the way home. It was 9:30 in the morning and Daniel was going to be hard at work back at home. I wanted to get some treats for us to have as a mid-morning snack to celebrate me defending my thesis… and lo and behold, there, on the bakery shelf, was bienenstich! Obviously, I bought two huge pieces. The shop boy carefully wrapped them up in paper and I carried them, triumphant, back to the room. We feasted. Then Daniel said he felt sick, because he never eats sugar for breakfast. So, now that I have a wonderful kitchen here in Sweden, I set out to actually make the darn thing. I had the perfect occasion: Johanna and her sister Matilda left on Tuesday morning to go travel around New Zealand for three weeks! They were giddy on Monday night thinking about all the adventures they were about to embark upon. I know that feeling. Now that they’ve been gone a few days, I am seeing a few of Johanna’s beautiful photos pop up on facebook, and so I know that they are having a great time. It makes me smile to think of these two sisters traveling around together. They are both a combination of practical and whimsical. Johanna is a biologist who is also training as a teacher and is quite artistic as well. Matilda has been doing more on the artistic side, but is now preparing with exams to go into medical school. Actually, she’s the more practical one. Johanna will take pictures of everything on her phone, seeing beauty in every object and every angle. She’ll get distracted talking on the phone. She is a wonderful, fun, joyous, presence. Matilda is as well, but she’ll give a huff of friendly exasperation every once in a while. Anyway, on Monday afternoon, the dough didn’t seem to be rising at all. I decided not to freak out. And in the end the cake tasted fine, and certainly wasn’t a brick. 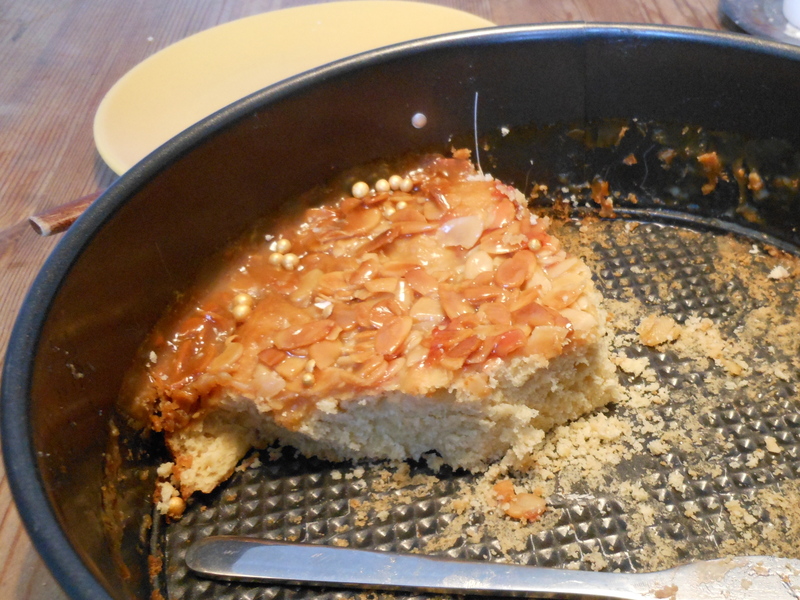 However, the bienenstich I remember from Munich was ridiculously light and fluffy, unlike any yeasted dough I’ve ever eaten. So that was one big difference; maybe I know, now, why Deb had such a hard time getting the recipe right. I couldn’t find instant yeast in the grocery store here so adapted to use active dry, which may have affected the rising and the behavior of the dough. 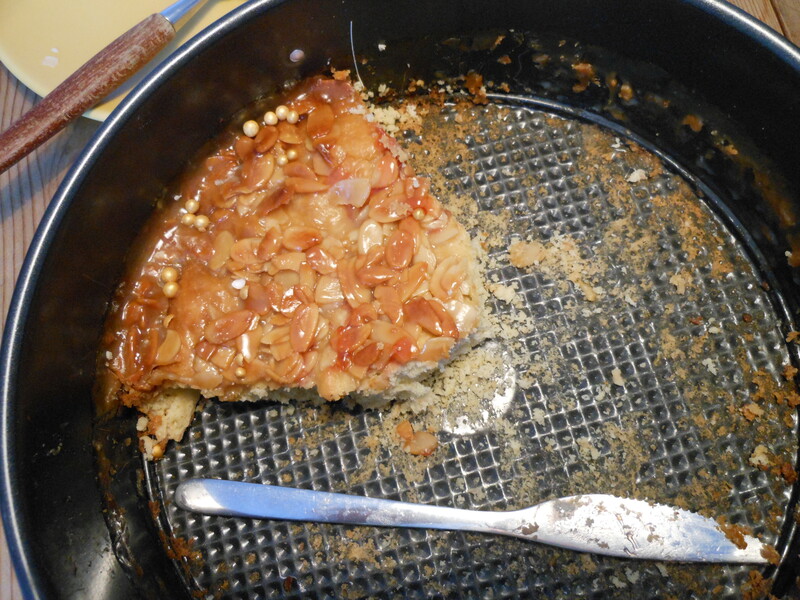 I was also too lazy to stuff the middle of the cake with pastry cream – something I really would like to do next time! But never fear, if you leave it out, the cake is still delicious. I upped the amount of salt in the topping and so it had a bit of a salted caramel taste. Yum yum yum. Most of my friends know that I reallllly like to bake. And cook. But baking is something particularly satisfying: you follow some instructions, maybe it’s scary and complicated, but in the end, if you do everything you’re told, you come out with the end product you were supposed to get. It’s so great! That never happens in life. Over Christmas break I had my baking fix when Min Ya, Kristel, and I made an extremely complicated bûche de noël. I think they were a little incredulous as we were making the four different parts, and it didn’t turn out quite like the picture but it was still beautiful and very tasty. Maybe then they started realizing why I’m hooked on baking ridiculous, over-the-top complicated desserts. I’m now living in Uppsala in a real apartment, with a real kitchen and all the kitchen-y things inside. So I finally, for one of the first times since beginning my masters program, can do some serious baking. Last week my roommate Marta’s boyfriend Gonçalo arrived from Portugal to work at the department here for a month, so it seemed like the perfect occasion for a cake. Marta and Gonçalo and I all lived on the same corridor in Flogsta during my very first semester in Sweden. So I was pretty excited to see Gonçalo again coming back to visit! 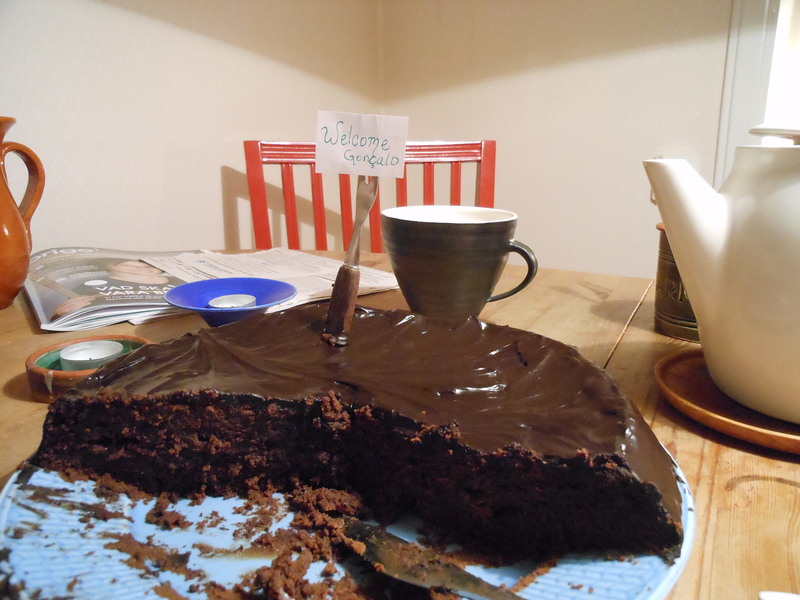 This is a heavy, dense chocolate cake. It’s tangy with buttermilk (or filmjölk, an even thicker version they have here in Sweden) and tastes slightly of coffee, with some seedy sweetness of raspberry jam and a thick coating of ganache. Mmmmm. Preheat oven to 325, and grease two round cake pans. Do whatever your chosen magic is to ensure that the cake won’t stick to the pan – flour it, dust it with cocoa, just grease it, you do you. Mix everything together until the mixture is smooth and uniform. Divide between the two cake pans and bake for about 40 minutes (check after 30 minutes). Let them cool ten minutes in their pans, then try to turn them out onto a cooling rack. Once the cakes are cool, place one on a platter. Spread the top with a thin, but not too thin, layer of raspberry jam (not jelly). Place the second cake on top of the first one. Make a ganache: this means equal parts cream and chocolate. I did 250 grams of dark chocolate and 250 mL heavy whipping cream, and it was a little too much, but who doesn’t want to have some leftover chocolate? Anyway, cut up the chocolate into very small pieces and put it in a bowl. In the meantime, heat the cream in the microwave or on the stove until it is almost boiling. Then pour it over the chocolate and stir, stir, stir. Eventually the chocolate will melt and the mixture will become thick and uniform. Let it cool for a bit until it begins to thicken up, then use a spatula to spread it all over the cake, like a chocolate casing. As the cake cools, the ganache will harden into something almost like a shell. I have been meaning to write something about my last day in Ruhpolding, as it was lovely… not sure if I’ll ever get around to it. Life is busy! I moved to Uppsala successfully and am living in a beautiful flat with my friends Marta and Johanna. It’s so great to be back in Sweden. On Thursday I competed in the district championship relay team with my little club here, Uppsala Vasaloppsklub. 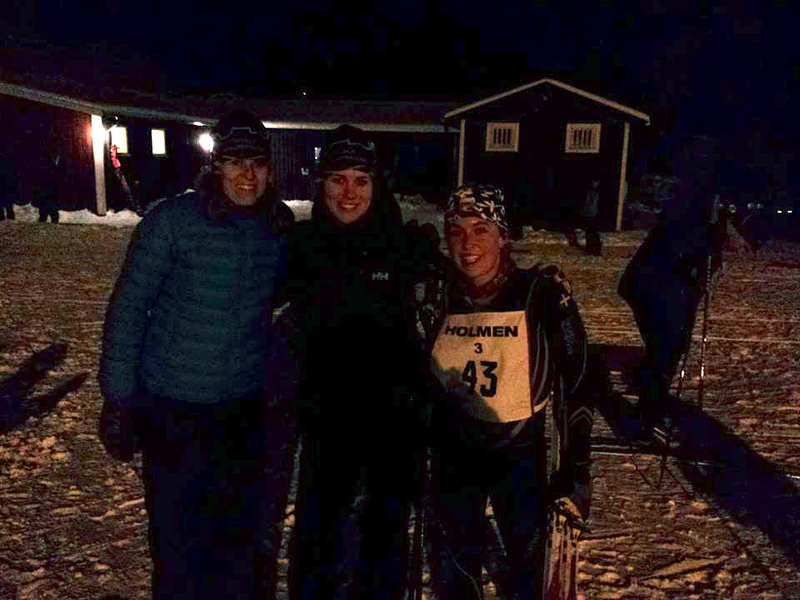 Our team was: Christina, who could be in the 35+ age division but we didn’t have any other women interested in racing, so she competed in the 17+ division with us – she’s good; Karin, who is also good but is also quite pregnant! ; and me, anchoring. They classic skied, I skated. It was the first time that UVK ever had a women’s relay team so we were really really excited just to be there competing. We finished third! The race was at night which is always fun as you feel like you’re really zooming along when it’s dark out, just flitting between the lights on the trail. 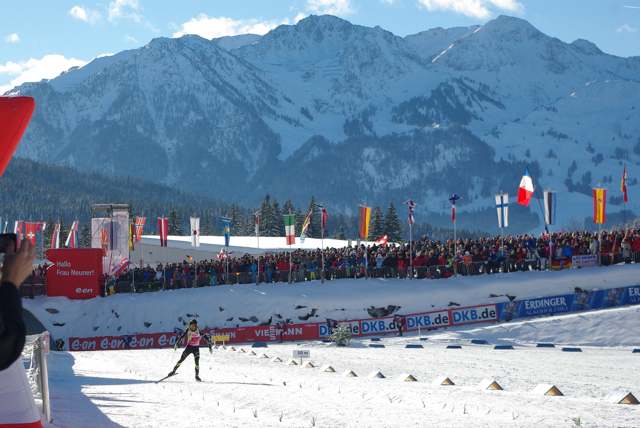 Photo by Jon Orvendal who was sick and couldn’t race, so he came to watch and was SO frustrated not to be skiing. I really had so much fun being back with my skiing friends! Anyway, besides that, I made a quick trip to Gotland, a large Swedish island in the Baltic. My supervisor lives and works there on a separate campus of Uppsala University, so I was there for two days. It was quite productive as we finished one manuscript which is getting ready for submission, and started working with the dataset for the next two papers. Also I got to see some of the city, which is a really cool old place. The city walls are from the 1200s and it is a UNESCO World Heritage site. As my supervisor lives there, you’ll hear much more about my future trips to Visby as well. It’s just a 45 minutes flight from Stockholm or you can take a ferry. Based on my first visit, a highly recommended destination!